At any age, a disruption in our sense of balance and equilibrium can be devastating to our independence and health. Recent research tells us that imbalance, symptoms of vertigo and other vestibular disorders can be improved with physical therapy. 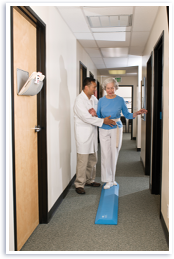 Falls and injuries can be prevented and walking confidence restored. Balance is maintained by the coordination of three systems: vision, vestibular (inner ear) and somatosensory (sensation in the skin and joints) systems. They work together to provide accurate information to the brain regarding our sense of equilibrium. Dysfunction in any one of these systems can provide inaccurate information to the brain, causing imbalance and increasing your risk for falling. The physical therapists at Praxis Physical Therapy are trained to evaluate each system and create a personalized treatment program to address your impairments and lower your risk of falling. At Praxis Physical Therapy we use objective measurements to assess fall risk. You will receive one or more scored balance tests that tell you if you are at risk for falling. Treatment will be focused on getting you out of the fall risk category. We use various procedures to challenge your visual, vestibular and somatosensory systems. We also utilize the Epley or canalith repositioning maneuver to treat BPPV (benign paroxysmal positional vertigo). Gaze stabilization, habituation and balance exercises are used as necessary to treat both peripheral and central vestibular dysfunctions. Our goal is to improve your function so you can reduce your fear of falling and regain your independence. 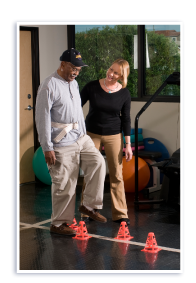 Ask your doctor to refer you to our fall prevention program.